The Millennium Bridge, officially known as the London Millennium Footbridge, is a steel suspension bridge for pedestrians crossing the River Thames in London, linking Bankside with the City of London. It is located between Southwark Bridge and Blackfriars Railway Bridge. It is owned and maintained by Bridge House Estates, a charitable trust overseen by the City of London Corporation. Construction began in 1998, and it initially opened in June 2000. The bridge seen from St Paul's Cathedral. Londoners nicknamed the bridge the "Wobbly Bridge" after pedestrians experienced an alarming swaying motion. The bridge was closed later on opening day and, after two days of limited access, for almost two years while modifications were made to eliminate the motion. It reopened in February 2002. The southern end of the bridge is near the Globe Theatre, the Bankside Gallery, and Tate Modern, while the northern end of the bridge is next to the City of London School below St Paul's Cathedral. The bridge alignment is such that a clear view (i.e. a "terminating vista") of St Paul's south façade is presented from across the river, framed by the bridge supports. The design of the bridge was the subject of a competition organised in 1996 by Southwark council and RIBA Competitions. The winning entry was an innovative "blade of light" effort from Arup Group, Foster and Partners, and Sir Anthony Caro. Due to height restrictions, and to improve the view, the bridge's suspension design had the supporting cables below the deck level, giving a very shallow profile. The bridge has two river piers and is made of three main sections of 81 m (266 ft), 144 m (472 ft), and 108 m (354 ft) (north to south) with a total structure length of 325 m (1,066 ft); the aluminium deck is 4 m (13 ft) wide. The eight suspension cables are tensioned to pull with a force of 2,000 tons against the piers set into each bank—enough to support a working load of 5,000 people on the bridge at one time. London Millennium Bridge at night. This image shows the well known and much photographed illusion of St. Paul's Cathedral being supported by one of the bridge supports. Ordinarily, bridges across the River Thames require an Act of Parliament. For this bridge, that was avoided by the Port of London Authority granting a licence for the structure obtaining planning permissions from the City of London and London Borough of Southwark. Construction began in late 1998 and the main works were started on 28 April 1999 by Monberg & Thorsen and Sir Robert McAlpine. The bridge was completed at a cost of £18.2M (£2.2M over budget), primarily paid for by the Millennium Commission and the London Bridge Trust. It opened on 10 June 2000 (two months late). Unexpected lateral vibration (resonant structural response) caused the bridge to be closed on 12 June 2000 for modifications. Attempts were made to limit the number of people crossing the bridge. This led to long queues but was ineffective to dampen the vibrations. Closure of the bridge only two days after opening attracted public criticism of it as another high-profile British Millennium project that suffered an embarrassing setback, akin to how many saw the Millennium Dome. Vibration was attributed to an under-researched phenomenon whereby pedestrians crossing a bridge that has a lateral sway have an unconscious tendency to match their footsteps to the sway, exacerbating it. The tendency of a suspension bridge to sway when troops march over it in step was well known, which is why troops are required to break step when crossing such a bridge. The bridge was temporarily closed on 18 January 2007, during the Kyrill storm due to strong winds and a risk of pedestrians being blown off the bridge. The bridge's movements were caused by a 'positive feedback' phenomenon, known as synchronous lateral excitation. The natural sway motion of people walking caused small sideways oscillations in the bridge, which in turn caused people on the bridge to sway in step, increasing the amplitude of the bridge oscillations and continually reinforcing the effect. On the day of opening, the bridge was crossed by 90,000 people, with up to 2,000 on the bridge at any one time. Resonant vibrational modes due to vertical loads (such as trains, traffic, pedestrians) and wind loads are well understood in bridge design. In the case of the Millennium Bridge, because the lateral motion caused the pedestrians loading the bridge to directly participate with the bridge, the vibrational modes had not been anticipated by the designers. The crucial point is that when the bridge lurches to one side, the pedestrians must adjust to keep from falling over, and they all do this at exactly the same time. Hence, the situation is similar to soldiers marching in lockstep, but horizontal instead of vertical. After extensive analysis conducted by the engineers, the problem was fixed by the retrofitting of 37 fluid-viscous dampers (energy dissipating). These include 17 chevron dampers (long V-shaped chevron braces under the deck panels) to control lateral movement, 4 vertical to ground dampers to control lateral and vertical movements, and 16 pier dampers to control lateral and torsional movements. Additionally, 52 tuned mass dampers (inertial) to control vertical movement. This took from May 2001 to January 2002 and cost £5M. After a period of testing, the bridge was successfully reopened on 22 February 2002. The bridge has not been subject to significant vibration since. In spite of the successful fix of the problem, the affectionate "wobbly bridge" epithet remains in common usage among Londoners. An artistic expression of the higher-frequency resonances within the cables of the bridge were explored by Bill Fontana's 'Harmonic Bridge' exhibition at the Tate Modern museum in mid-2006. This used acoustic transducers placed at strategic locations on the cabling of the Millennium Bridge and the signals from those transducers were amplified and dynamically distributed throughout the Turbine Hall of the Tate by a programme which Fontana entered into the sound diffusion engine of the Richmond Sound Design AudioBox. Showing the cable suspension system. The Bridge is featured in Harry Potter and the Half-Blood Prince, where the bridge collapses following an attack by Death Eaters. The Bridge appears in the 2014 Marvel Cinematic Universe film Guardians of the Galaxy during the climactic battle on Xandar. The Bridge appears in the Olly Murs music video "Heart on My Sleeve." The bridge appears in the anime adaptation of The Ancient Magus' Bride. The bridge appears in the BBC One's television film The 7:39. The bridge is featured in shots from Taylor Swifts ‘End Game’ music video (2018). The bridge is featured in shots from One Directions 'Midnight Memories' music video (2014). The bridge is briefly featured in the Julian Barnes 2011 Man Booker Prize-winning novel “The Sense of an Ending”. The bridge is briefly shown at the end of a Netflix Original Show, Black Mirror, in Season 1, Episode 1 ("The National Anthem") after the Prime Minister was forced to commit crude behaviors on live TV in order to get a Princess back from an extremist group. ^ Jeans, James. Science and Music. Cambridge University Press. p. 56. ^ BBC news: "High winds cause damage at Lord's" 18 January 2007. ^ Josephson, Brian (14 June 2000). "Out of step on the bridge". Guardian Letters. Retrieved 22 March 2018. ^ Strogatz, Steven et al. (2005). "Theoretical mechanics: Crowd synchrony on the Millennium Bridge," Nature, Vol. 438, pp, 43–44. ^ Julavitz, Robert. "Point of Collapse," Village Voice. 26 August 2003. ^ "All troops must break step on Albert Bridge". Archived from the original on 25 January 2014. ^ Dallard, P. et al. "The London Millennium Footbridge," Archived 27 September 2011 at the Wayback Machine Structural Engineer. 20 November 2001. 79:22, pp. 17–35. ^ Taylor, Douglas P. Damper Retrofit of the London Millennium Footbridge - A Case Study in Biodynamic Design (PDF). Taylor Devices, Inc. Retrieved 14 March 2019. ^ Klembczyk, Alan R. A Study in the Long-Term Performance of Specialized Low Friction Hermetically Sealed Fluid Viscous Dampers Under Nearly Continuous Operation on a Pedestrian Bridge (PDF). Taylor Devices, Inc. Retrieved 14 March 2019. ^ "Millennium Bridge over the River Thames, joining the Tate Modern and St Paul's London – photos, history and background". Urban75.org. Retrieved 26 March 2013. ^ Lydall, Ross (27 October 2009). "Second wobbly bridge for London – News – London Evening Standard". Thisislondon.co.uk. Archived from the original on 30 October 2009. Retrieved 26 March 2013. ^ "Harry Potter Film Locations in London – Millennium Bridge". Golondon.about.com. 5 March 2014. Retrieved 10 July 2014. ^ Shahid, Sharnaz (11 August 2013). "Guardians Of The Galaxy Cast Get Physical In London Shoot". Entertainmentwise. Archived from the original on 30 June 2014. Retrieved 11 August 2013. Reaney, Patricia. (6 November 2005). "Why the Millennium Bridge wobbled". New Sunday Times, p. F20. 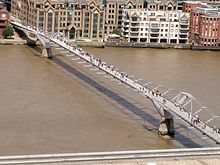 Wikimedia Commons has media related to London Millennium Bridge. Information about the GERB TMDs retrofitted to the bridge.